This is such a real change of direction for one of my favourite historical fiction authors, that I have been quite taken by surprise, not by her writing skill, as that's always on top form, but by her ability to place me very firmly in the present with a compelling, contemporary story, which also has a dark and deeply troubled past. 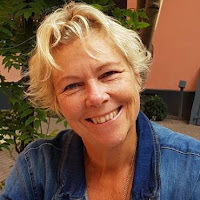 Helle Madsen is dominated by Sam Woolf, her manipulative, and it must be said, quite evil boss who, it seems, will stop at nothing to get what he wants. That he wants Helle, with a passion bordering on obsession, is obvious from the start of the novel. However, there is also someone else who wants Helle with an equal passion. Business man, Jason Morris has loved Helle forever, and as their past lives start to explode and combine, so a story of desire, longing and the settling of old hostilities starts to come to life. Ensnared in a never-ending cycle of love, lust and hatred, the three main characters, who dominate the story, have had more than their fair share of anguish to contend with as they hurtle through time. 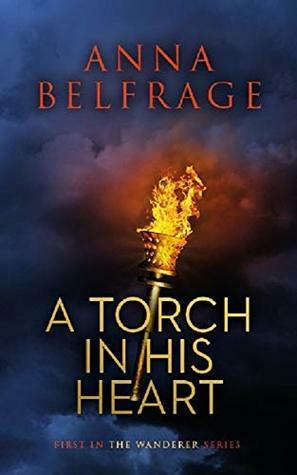 Written with this skilful author's trademark fine attention to detail, A Torch in his Heart fairly sizzles with passion. Never one to shy away from intimacy in her novels, this dark and moody paranormal story goes to a whole new level of scorching sexuality. The author’s ability to create passionate romance is unequalled and she certainly doesn’t shy away from eroticism bringing together two of her characters with a sexual explicitness which may not be to everyone’s taste. Had Anna been allowed to choose, she’d have become a time-traveller. As this was impossible, she became a financial professional with three absorbing interests: history, romance and writing. 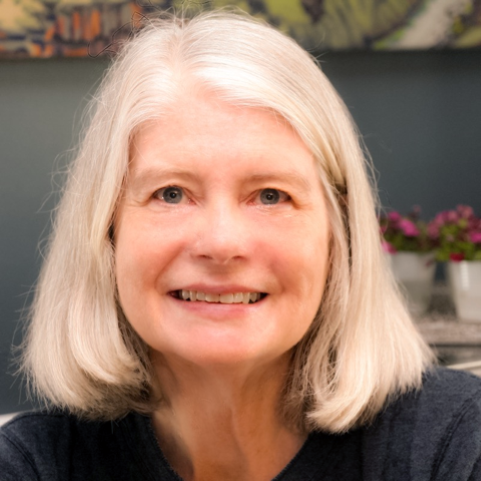 Anna has authored the acclaimed time travelling series The Graham Saga, set in 17th century Scotland and Maryland, as well as the equally acclaimed medieval series The King’s Greatest Enemy which is set in 14th century England. 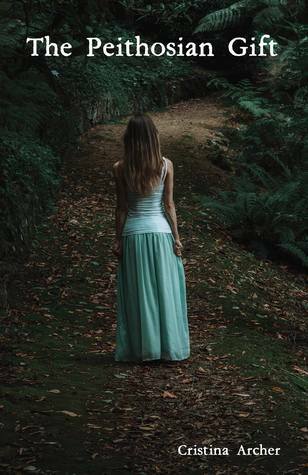 She has recently released the first in a new series, The Wanderer. This time, she steps out of her normal historical context and A Torch in His Heart is with a fast-paced contemporary romantic suspense with paranormal and time-slip ingredients. She has loved writing it – she hopes her readers will like reading it just as much. Marking the change of season as we go into winter is always a time for contemplation as days become shorter and the dark takes over. Moving to the rhythm of the seasons doesn't always come easily to us, as deprived of light we can struggle to make sense of the world around us. For this author the answer to his difficulty in adjusting to the dark days was to keep a diary of his thoughts, feelings, observations and actions. On the book's journey, we go from the onset of winter, in October, to the beginning of spring. in March, where the lyricism of the words and the author's natural skill in observation takes you completely into his world. 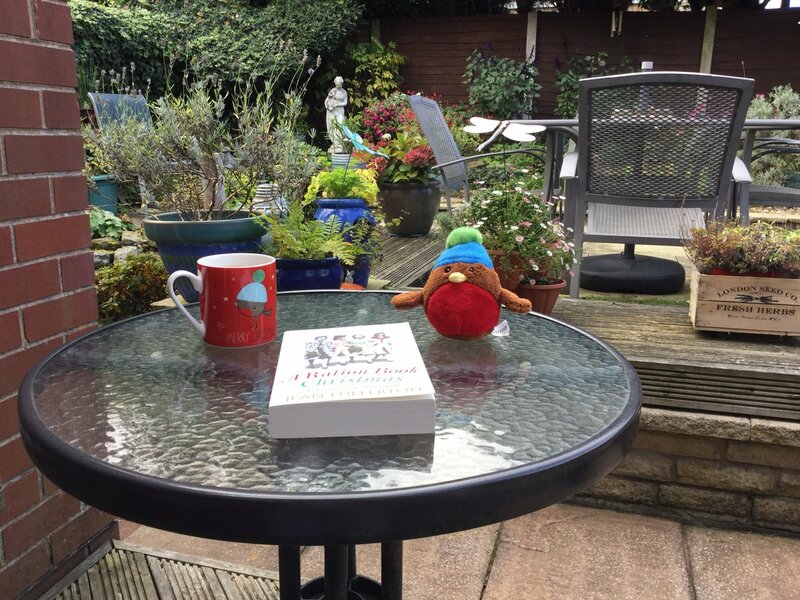 His relationship with his partner, his children and his mother, his upbringing in Wales, all play a central role in the careful way the book evolves. Throughout the book there's a real magical quality to the imagery, the author has such a lovely way with words and brings scenes and emotions vividly to life. I found that I spent some time going back over particular sentences because they were so lovely.."..a word containing a silver moon and the crackle of burning twigs, flying things and Kings led by stars, berries, gold and pheasant feathers" conjured Christmas quite perfectly. 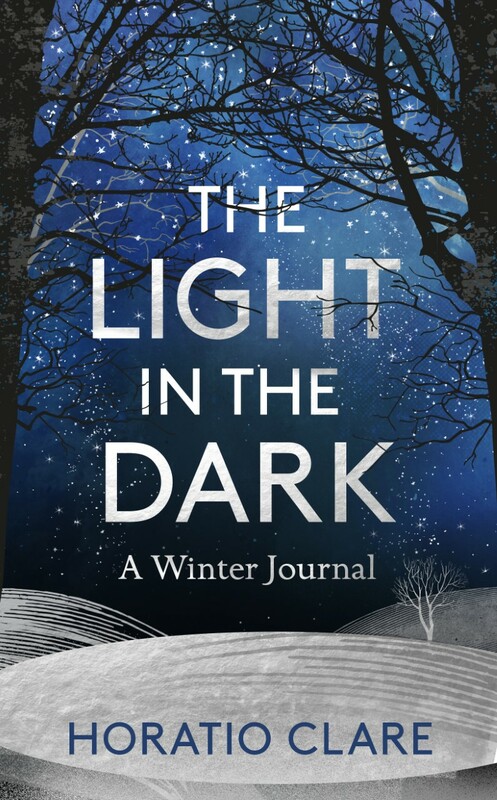 Throughout The Light in the Dark the authors bares his soul and I found that to be quite an emotional experience. I appreciated his honesty in the way he deals with, and shares, his darker moments and rejoiced when everything seemed to be on a more even keel for him and his family. There is much to reflect upon in this Winter Journal, particularly if you too struggle with darker days, however, as the author reminds us, "Spring will come. It will come"
Horatio Clare is a critically acclaimed author and journalist. His first book, Running for the Hills: A Family Story, won the Somerset Maugham Award. 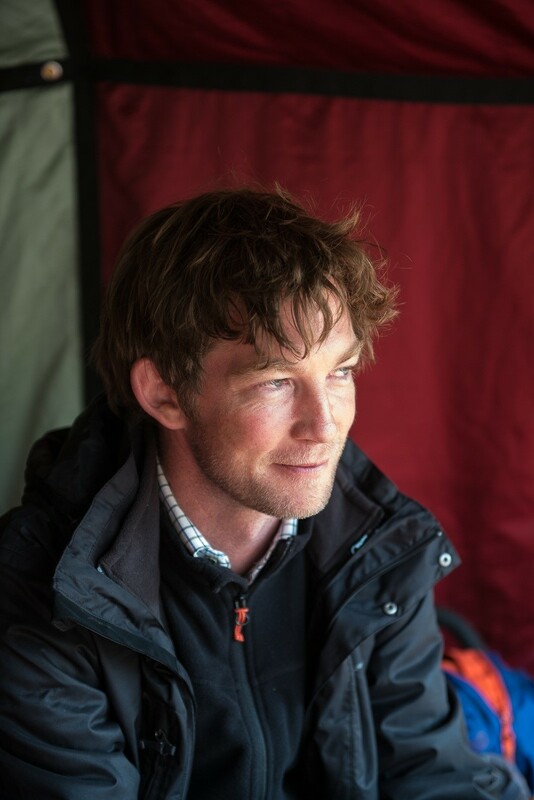 His second book, Truant is ‘a stunningly-written memoir’, according to the Irish Times. A Single Swallow: Following an Epic Journey from South Africa to South Wales, was shortlisted for the Dolman Travel Book of the Year; Down to the Sea in Ships: Of Ageless Oceans and Modern Men won the Stanford-Dolman Travel Book of the Year 2015. Horatio’s first book for children, Aubrey and the Terrible Yoot, won the Branford Boase Award 2016 for best debut children's book. He lives in West Yorkshire. With Christmas approaching, the Brogan family of London's East End are braving the horrors of the Blitz. With the men away fighting for King and Country and the ever-present dangers of the German Luftwaffe's nightly reign of death and destruction, the family must do all they can to keep a stiff upper lip. 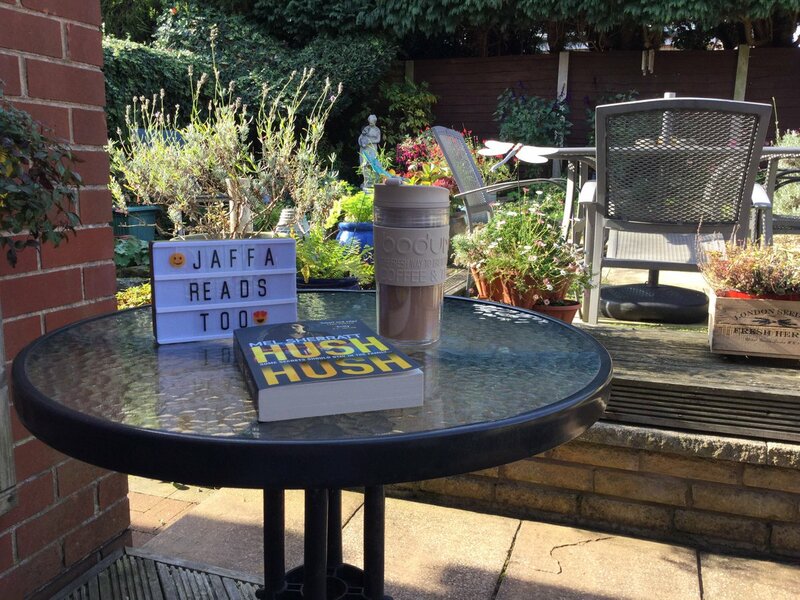 London, during the Blitz of 1940, is not a safe place to be, and and yet, for the Brogan family, East Enders to the very marrow of their bones, there really is no place like home, and not even the Luftwaffe's deadly campaign will make them feel otherwise. 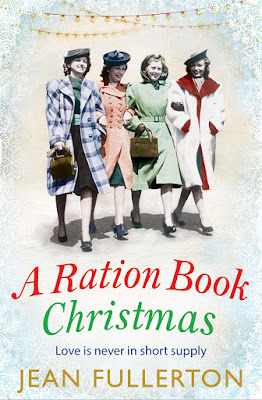 A Ration Book Christmas concentrates on the story of Jo, the younger of the Brogan daughters, who, with characteristic Brogan stoicism, decides that it is time for her to do her bit for the war effort, this allows the story to focus on the fascinating work of those rescue teams who scurried around London as bombs were falling. It's a real joy to return to this feisty London family, you may remember that we first met them in, Pocketful of Dreams, which is the first book of the series. In this continuation we are only a little further on in time and yet, lots have happened to the family. 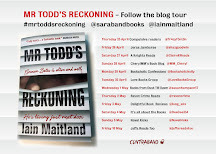 It was interesting to see just how some of the stories continued, particularly around, Mattie, who we followed in Pocketful of Dreams. 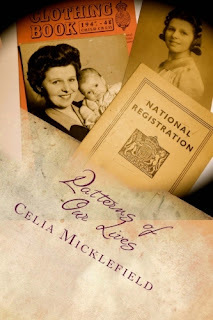 As always, with this author's writing, there's a real sense of both family and community, and the details of living through the horror of the Blitz really comes alive, the constant sense of danger and undeniable grief is interspersed with characteristic humour, especially from Queenie, the Brogan family matriarch who is determined to fight Hitler in her indomitable way. 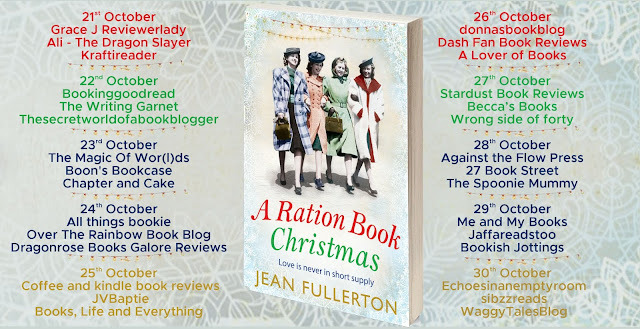 Time and place is captured quite perfectly and there is never a time when the story doesn't place you back in the London of 1940, a time when food rationing meant real hardship, and making ends meet was never more important. However, despite the constant threat of danger life goes on, and Jo is about to find out, to her cost, just what fate has in store. Her association with the notorious Sweete brothers, and Tommy in particular, will test her resolve more than ever. A Ration Book Christmas is a wonderful war-time saga, written with all the warmth and skill we have come to expect from this talented author, whose fine attention to detail and meticulous research brings the East End of London to life in a quite a special way. There are some interesting wartime recipes at the back of the book - I think I'm going to try the Christmas cake recipe, it sounds delicious. Iconic paintings from WW1 are on display including two of my favourites. I first saw The Menin Road when I visited the Imperial War Museum on a school trip to London in the 1970s. 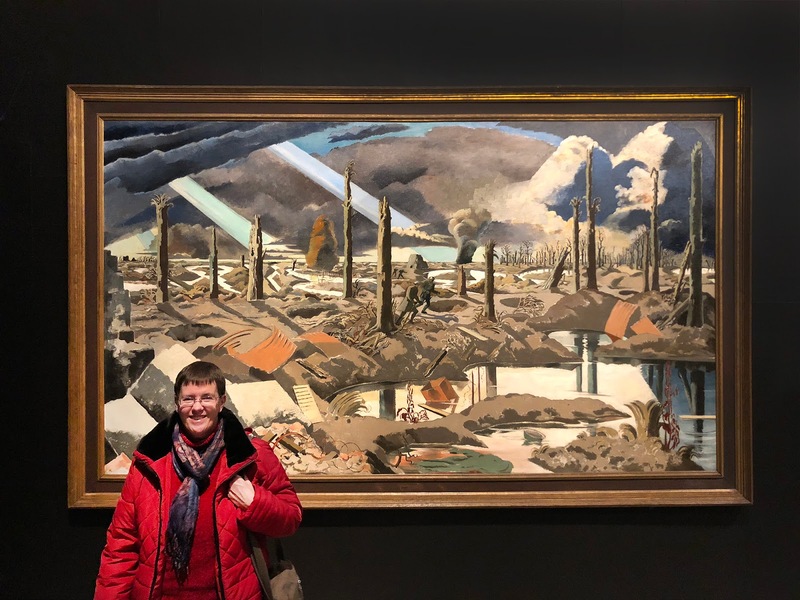 This iconic painting left a memorable impression and is still an evocative reminder of the devastation left behind by the fighting on the Western Front. Will Starling has been drafted into the SOE, joining forces with the French Resistance, but his memory is fractured and only occasional flashbacks reveal fragments of his past. While Will fights to prevent genocide, his sister, Rose, has become the key to VIPER’s future plans and is drugged to dull her kinetic powers. But Rose faces danger from an unexpected enemy and her time is running out. The Red Storm starts off with an impressive opener which is a perfect introduction to Will Starling who is one of the most courageous, fictional, eighteen years olds I have ever met. Filled with a boys own sense of bravado, Will encounters more danger than is physically possible, from being unceremoniously dumped out of a moving aeroplane, to being covered in a poisonous red mist, there is never a moment when he doesn't rise to the challenge of being a vital part of the Special Operations Executive (SOE) during the eventful latter years of WW2. 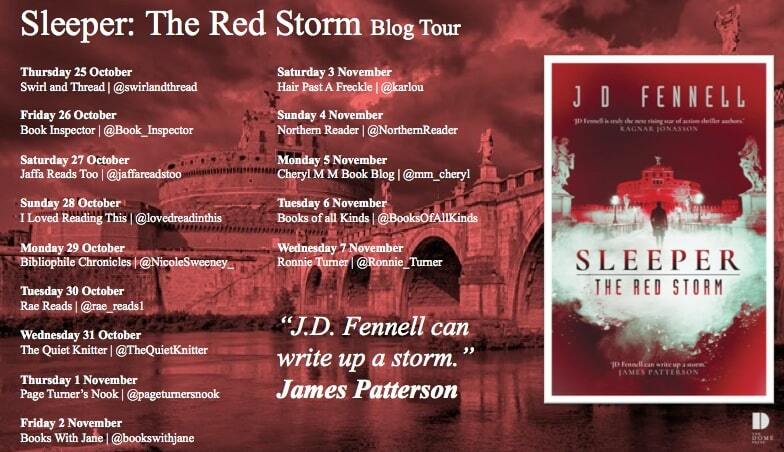 Set in 1943, The Red Storm continues, some two years after where Sleeper, the first book in the series, left off. Will is now a little older, possibly a little wiser, but no less determined to get to the truth of what happened to his family and especially to his younger sister, Rose. That Rose's story intertwines with that of Will makes for really interesting reading and is no less exciting. The story moves along at a cracking pace and is filled with more twists and turns than I am at liberty to speak about without giving too much away. However, the historical nature of the story, set as it is in 1943, comes across, as does the constant danger which Will encounters as he tumbles from one adventure to another. 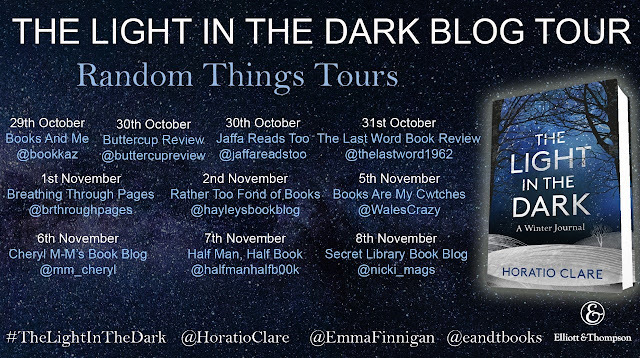 The author has created some fabulous characters, some are downright creepy, Father William springs to mind, whilst others, like Will's companion and co-agent, Anna Wilder add some necessary depth to what is , after all , quite a dark story. I raced through the book, carried along by the speed and momentum of the writing, and of Will's ability to always be in the centre of the action. 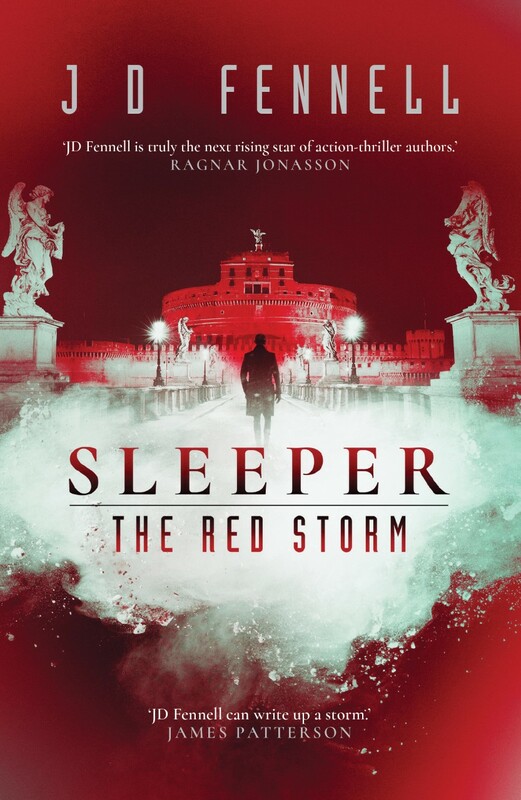 Even though this is the second book with events from the first story alluded to in the story, it is still possible to read read The Red Storm as a standalone story. 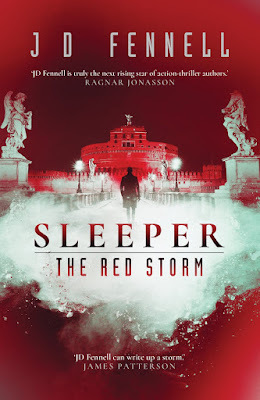 Please do enter the giveaway to be in with a chance of reading Sleeper:The Red Storm for yourself, you'll be thoroughly entertained from start to finish. understand the madness unfolding around him.A lover of reading, he devoured a diverse range of books - his early influences include Fleming, Tolkien,Shakespeare and the Brontës. He left Belfast at the age of nineteen and worked as a chef, bartender, waiter and later began a career in writing for the software industry. These days he divides his time between Brighton and London, where he lives with his partner and their two dogs. understand the madness unfolding around him. A lover of reading, he devoured a diverse range of books - his early influences include Fleming, Tolkien,Shakespeare and the Brontës. He left Belfast at the age of nineteen and worked as a chef, bartender, waiter and later began a career in writing for the software industry. These days he divides his time between Brighton and London, where he lives with his partner and their two dogs. Hello to all you lovers of books. 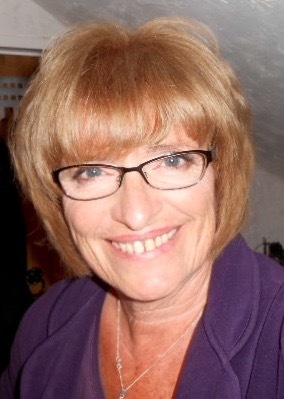 And a big thank you to Jo for giving me this opportunity to reach more of you through her website. Celia Micklefield is my maiden name. I thought it was a good idea to use it as my pen name. You know, it’s different. Maybe it would be a bit more memorable than Smith. I didn’t realise what a pain it would be fitting it on the front cover of my novels! I come from West Yorkshire. Keighley was an industrial town full of textile mills and factories, good butchers who made irresistible pies and pasties, enough pubs to sink a fleet and a population replete with memorable characters. Some of those characters find their way into my novels and short stories and in my first novel, Patterns of Our Lives , I used a mix of Keighley and its neighbour, Bingley in my creation of Kingsley, a northern town at the outbreak of World War Two. All my work is character-led. Whether I’m writing a family saga or a darkly satirical short story I have to know my characters inside out and upside down. How else would I be able to give them authentic dialogue? I prefer to know my settings well, too. My work in progress, A Measured Man is set in Norfolk where I live now. It’s a battle-of-the-sexes comedy aimed at the older reader. I've long felt a need for more choice in novels with protagonists in my own age group. 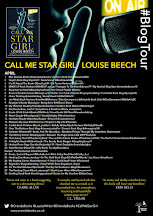 I was so irritated by the dearth in this sub-genre I posted about it on my website. I’ve never liked having to classify my work into a genre. I understand the reasons for the need but I don’t want to limit myself into formal literary boundaries. I like variety in what I choose to read and in the stories I write. But in my books you can always expect ordinary people in extraordinary circumstances with complicated problems to face. 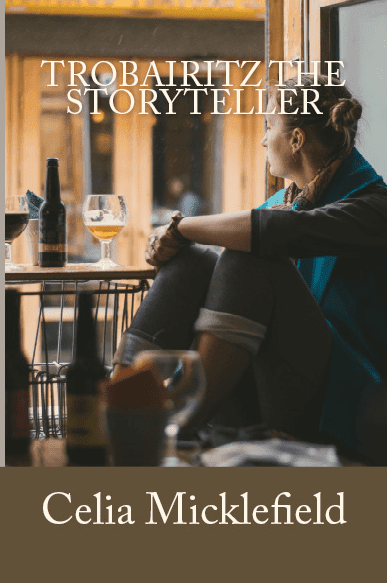 I lived abroad for nine years and set my second novel, Trobairitz - the Storyteller in the part of France I’d come to love. Trobairitz were female troubadours who brought news and sang songs about current affairs, romantic love and the role of women in society. I made my own lady troubadour a contemporary female truck driver whose problems echo those of her medieval sisters. I struggled describing the genre of this book, too. I think the recent ‘up-lit’ classification would suit it quite well. I began my writing career by selling short stories to women’s magazines. The first agent I approached with Trobairitz offered me a contract but it didn’t work out so I published myself as I had with Patterns of Our Lives. I’ve been on my own ever since. 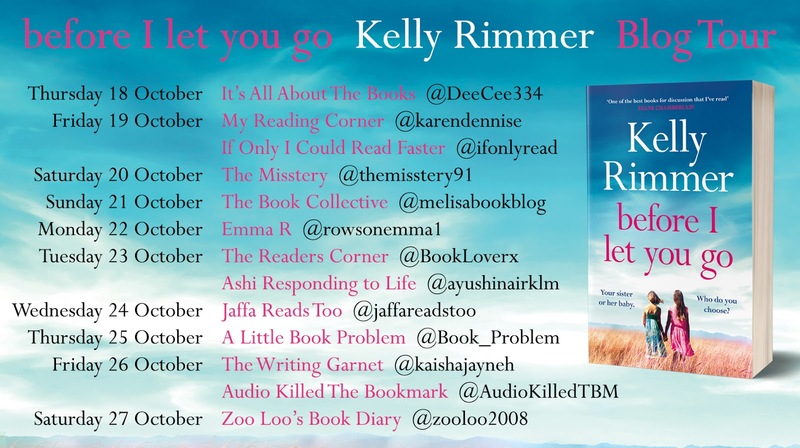 During my time in France I was on my way home to Yorkshire to visit family when a story idea hit me in the guts, as they do from time to time, while I was in the departure lounge at Montpellier airport waiting to board my flight to Leeds/Bradford. I knew I was grinning at the sound of a whole departure gate-load of Yorkshire accents. How wonderful to be surrounded by people who all sounded like me. I felt I was really going home. Then I spotted my characters: a father and his little daughter. She, administering tender, maternal care to the doll she had, her pouty expression alternatively cross and kind, was the epitome of miniature French coquettishness. She wore her hair in a tight top-knot and her tights were hooped in the height of fashion. Her French vowels were rounded and soft unlike the harder intonation of Occitanie. I wondered why this little minx was travelling to Leeds/Bradford. When her father spoke in English I was astounded. He was a Yorkshireman! Oh, the synapses fired up and by the time we’d landed I had the whole outline plotted. I sold that story and one evening as I was messing about on Twitter, I saw that the editor of The Dalesman was currently online. 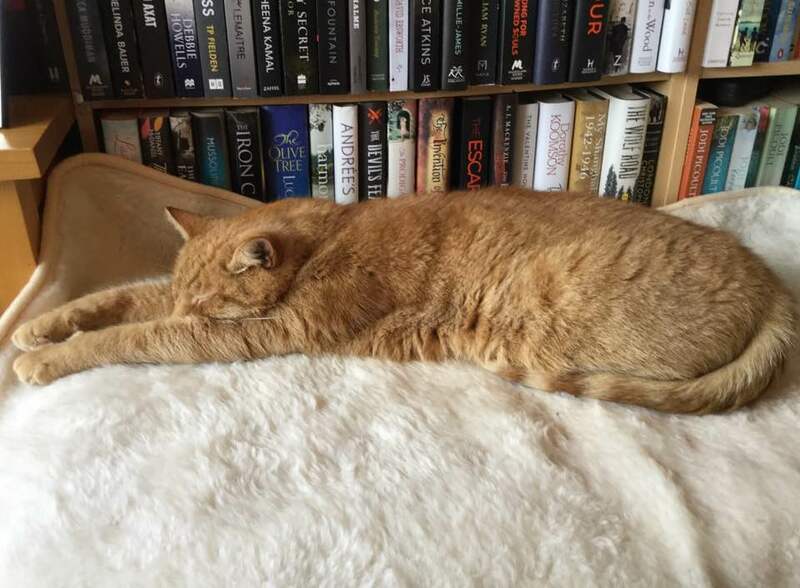 I don’t know where I got the nerve from but I pitched him right there and then, live on Twitter about the story I’d just sold and how the inspiration for it had come from a flight home to Yorkshire. So, I achieved a teenage ambition in writing You Can Take Grandma Out Of Yorkshire, for The Dalesman even if it was fifty years late. Copyright for that short story, Airport Departures has reverted to me and is now part of my second collection of short stories, Queer as Folk. 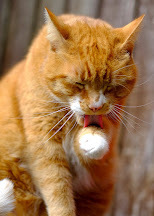 Do, please pop in and take a look, or better yet, Like my page. That way you’ll see when I run promotions and freebies on my books which are all available on my Amazon Celia Micklefield author page. 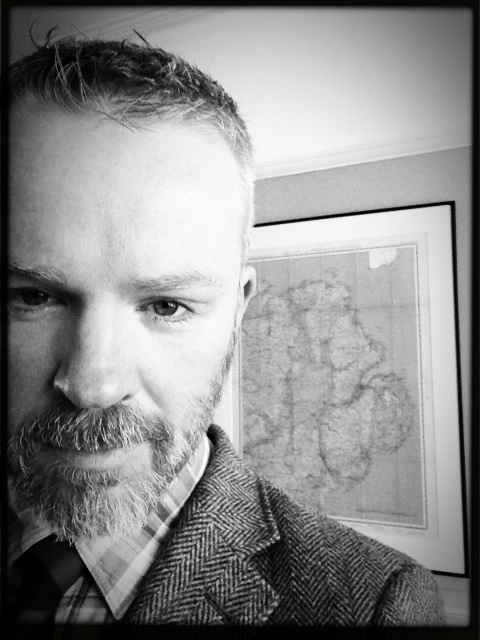 When I’ve finished with A Measured Man my next book in the pipeline is set once again in the north. The God of Putting Things Right is the book I attempted to write for NaNoWriMo but without success. I can’t do anything in a rush. I have a chronic pain condition called CRPS which not many people have heard of, including many in the medical profession. On bad days I don’t attempt too much. On better days I write. I’d like to be more involved with writers’ groups and have more energy for marketing my work but I have to accept it’s just not possible. 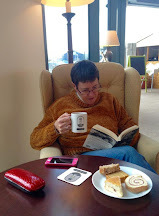 I stick to my own, slow pace and do what I enjoy most: my writing. I hope you enjoy it too. The Peithosian Gift is a speculative fiction novel about two warring clans with the power to control the minds of others. Since ancient times, the Morgans and the Kanes have violently disputed the right to use their gift. The present-day Morgans are outnumbered and persecuted by the Kanes for using their gift; most are in hiding, while others avenge the slaughter of their kin. The Kanes hunt and assassinate Morgans to prevent a mind-controlled world. While one clan seeks a ‘saviour’ to restore the imbalance, the other fears the birth of a too-gifted child. Radha, born of a third, lost clan, has superior powers that she is scarcely able to control. Events lead to a clash of clan leaders and key players, forcing Radha on the run with both sides hunting her. Mind games and mind control form the basis for this journey into the world of speculative fiction, which, I have to be honest and say, is not one of my go to genres. However, from the opening few chapters which set the scene in the ancient world, through to the bulk of the novel which brings the action into a more recognisable time, there is never a dull moment between the two opposing families who each seek control. Both the Morgans and the Kanes are decidedly hostile to each other and have been this way for generations. Each have the ability to control the minds of others, and yet, whilst the Morgans think it acceptable to do so, the Kanes feel that people should be free to make up their own minds. It is this concept which allows the author free rein to create a complicated world and where the story has its depth. There is much to take in, as the book is divided into distinct sections, and there are lots of characters to keep track of, and yet, the author succeeds, in this rather complicated plot, to allow the story to flow quite well, although, there were times when I found things a little confusing, and I had to back track in order to keep both the characters and the complicated plot in my head. I am sure that fans of speculative fiction and fantasy will find much to consider in The Peithosian Gift. I’m still not sure that this is ever going to be a comfortable genre for me, but I enjoyed being taken out of my comfort zone and given the chance to read something quite different. 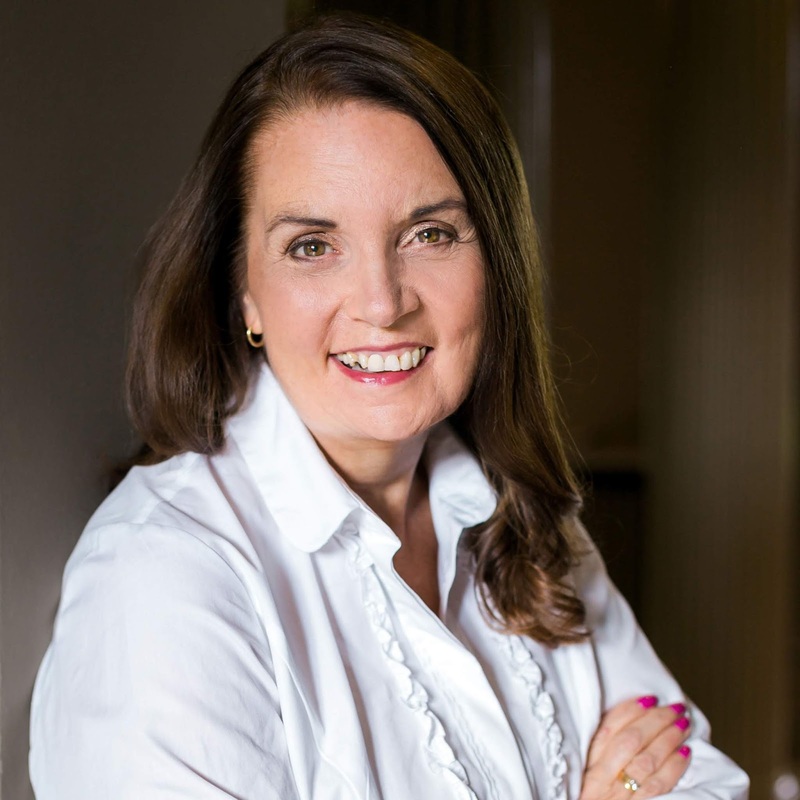 CRISTINA ARCHER has long been fascinated by philosophy and psychology and has been writing fiction with these themes in her spare time since she was a teenager. 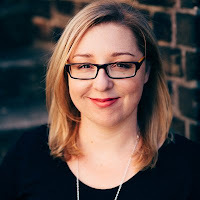 She writes speculative/fantasy fiction as she believes these genres offer the widest scope to explore many a "what if" question that is relevant today. 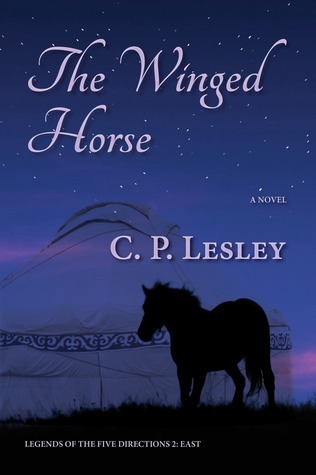 The Peithosian Gift is her fifth novel. Cristina Archer lives in Melbourne, one of the most inspiring cities in the world. More information about her and her books can be found at cristinaarcher.com. As children, Lexie and Annie were incredibly close. Bonded by the death of their beloved father, they weathered the storms of life together. When Lexie leaves home to follow her dream, Annie is forced to turn to her leather bound journal as the only place she can confide her deepest secrets and fears... As adults, sisters Lexie and Annie could not be more different. Lexie is a successful doctor and happily engaged. 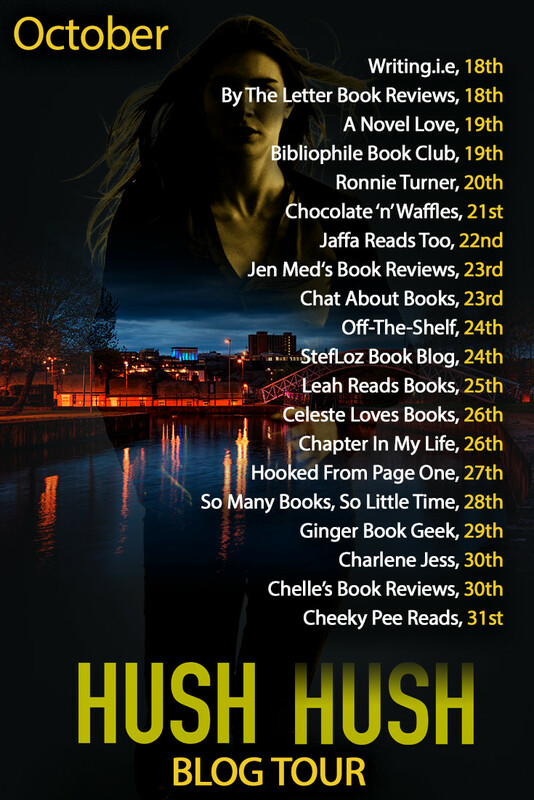 Annie is an addict - a thief, a liar and unable to remain clean. When Annie’s newborn baby is in danger of being placed in foster care, Annie picks up the phone to beg her sister for help. Will Lexie agree to take in her young niece? And how will Annie survive, losing the only thing in her life worth living for? 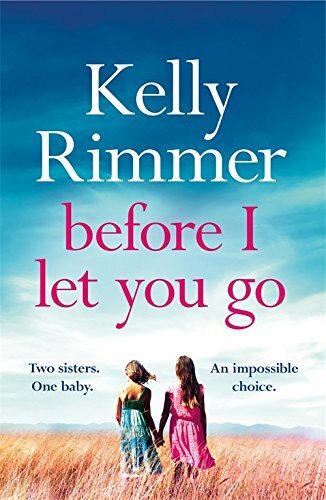 Before I let You Go is the story of two sisters, both are very different; one seems set on the path of righteousness, whilst the other has chosen to fall by the wayside. And yet, both are equally disturbed in their own way, victims of a childhood that was beset with tragedy and heartbreak. When Annie contacts her older sister, Lexie, for help, it is obvious from what is discovered that Annie is in deep trouble, drug addicted and heavily pregnant, Annie is facing, perhaps the biggest challenge of her young and troubled life. As always, Lexie, the older and wiser sister steps in to help Annie, but this time, perhaps, Lexie has taken on more than even she can manage. What then follows is a sad and yet, very readable story about a life spiralling out of control. Cleverly told in alternate chapters we get both Lexie and Annie's version of the events of their childhood, the loss of a beloved father and an upbringing which forced them to grow up long before their time. Annie's story which is told as a type of journal entry explains her long battle with drug addiction, and her anguish at what happens throughout the course of the story makes for compelling reading. 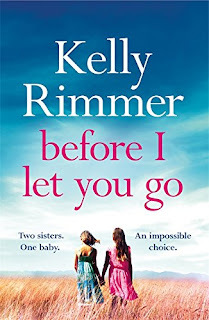 Before I Let You Go is one of those stories which grips from the very beginning. Its intense story line keeps you turning the pages faster and faster, first with sympathy for one sister, and then the other, both of them, most definitely, have their flaws, and yet there is a deep and abiding love between them. Worth a mention, by the very fact that he was such an all-round good guy, is Sam, Lexie’s boyfriend, who went above and beyond what was required of him to keep both sisters from falling completely part. Before I Let You Go is a truly thought-provoking story which made me question just how caring is the caring profession. I had no idea that drug addicted mothers in parts of the US who fail narcotics tests can be charged with the felony of chemically endangering a child. This story explains the anguish and utter heartbreak of such a dreadful situation and it is to the author’s credit that she has made such a heart-breaking story so compulsively readable. Hope Anderson faces the biggest dilemma of her life, not just in dealing with her own family problems but also considering if her long term boyfriend is going to be part of her future. Her family's summer house at Sunset Beach, North Carolina offers a sort of respite, and allows Hope the opportunity for some reflective time. When she meet the enigmatic, Tru Walls on one of her solitary beach walks, Hope feels an instant connection to him and even though Tru is only visiting Sunset Beach for a short time, the attraction between these two strangers is powerful and all consuming. There is no doubt that the author writes this type of romantic fiction extremely well. Both Hope and Tru are such well drawn characters that you can't help but fall headlong into their respective stories, and both are equally compelling with neither one seeking to outshine the other. I'm not a great believer in the idea of love at first sight, sexual attraction and lust most certainly, but deep love, I'm not sure, and yet, every moment of Every Breath certainly lends itself to the idea of falling in love at first sight and the author has done a great job of convincing me that it really can happen. There's an aching vulnerability to the story which I found quite charming. I have to admit that there were several times when emotion got the better of me and I found that I was reading with glistening eyes and a deep wish that all would work out for both Hope and Tru. What happens throughout the course of their respective stories is a sensitive exploration into the susceptibility of human emotion and of the overwhelming power of love in all of its many guises. The beautiful area around Sunset Beach is wonderfully described and the Kindred Spirit mail box on Bird Island actually exists, of course, I had to google it to see it for myself and spent a long time looking at images and stories. The importance of Kindred Spirit is revealed as the story progresses so I won't spoil that for you. With over 105 million copies of his books sold, Nicholas Sparks is one of the world's most beloved storytellers. His novels include thirteen no 1 New York Times bestsellers including The Notebook which was no 1 in the New York Times for 18 months. All Nicholas Sparks' books have been international bestsellers and have been translated into more than fifty languages. 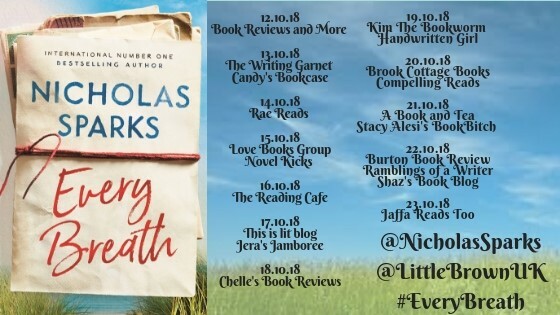 Eleven of Nicholas’s novels have been adapted into major Hollywood films starring Hollywood Greats including Kevin Costner, Richard Gere, Ryan Gosling, Channing Tatum, Zac Efron, Robin Penn Wright, Miley Cyrus and Liam Hemsworth. Films include: The Notebook (Ryan Gosling), Message in a Bottle (Kevin Costner), Dear John (Channing Tatum), The Longest Ride, The Best of Me, Safe Haven, The Lucky One (Zac Efron), The Last Song, Nights in Rodanthe (Richard Gere), A Walk to Remember, and The Choice. 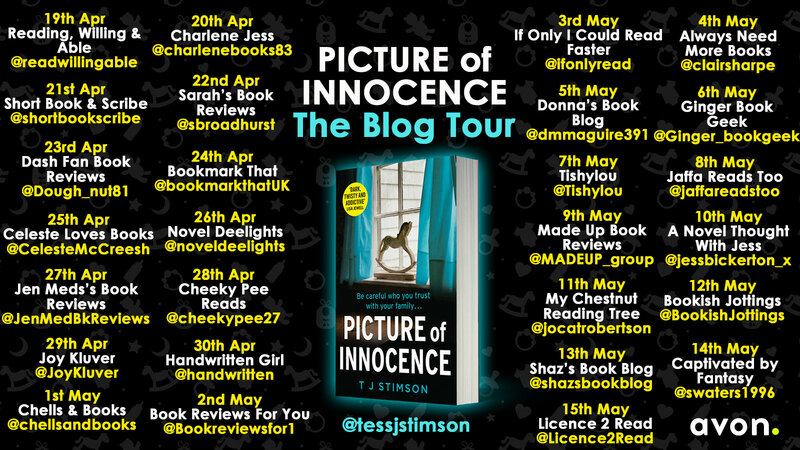 DS Grace Allendale knows that joining a new police investigative team is never going to be easy but what she doesn't envisage is getting drawn straight into a complicated murder mystery which involves her estranged family. 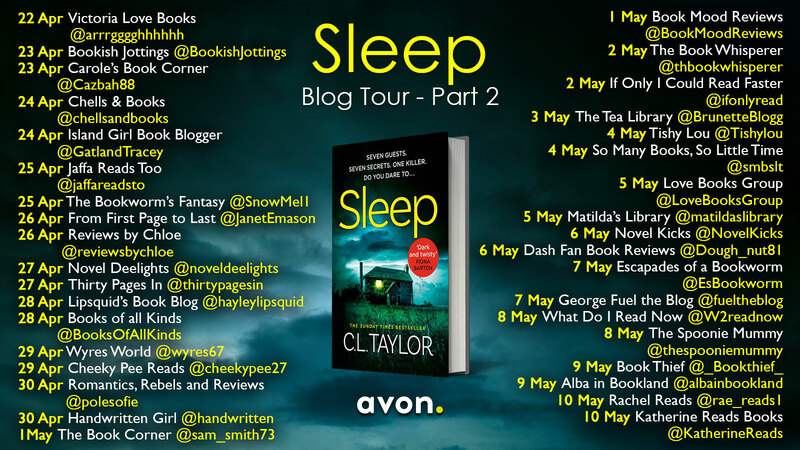 The Steeles are a canny bunch, they keep their friends close and their enemies closer, and despite Grace's connection to them, she is determined to discover just how deeply her family are involved in what's going on. The multiple strands of the investigation are woven together with a fine eye for detail and setting the story around Stoke on Trent, which is the author's home turf, certainly gives the story a really authentic feel. The steady investigation with all its many twists and turns had me on the edge of my seat and I enjoyed trying to second guess where the story was heading. 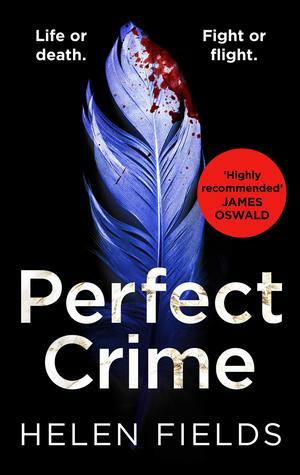 It's always exciting to be in right at the beginning of a new gritty crime series and this one certainly gets off to a flying start. There is a delicious edginess to the story which intertwines with a dark story from the past, all of which adds up to a really dark and well controlled murder mystery. 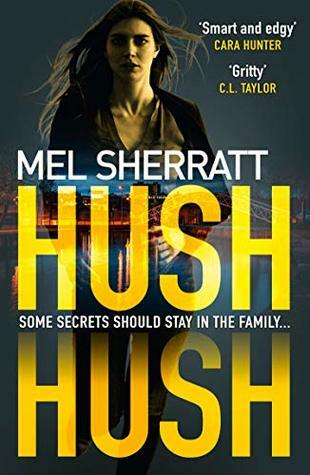 There are secrets aplenty to uncover, not just about Grace and her connection to the notorious Steele family, but also amongst her detective team, who, wary of this ambitious new addition to their group, keep their own particular secrets close. 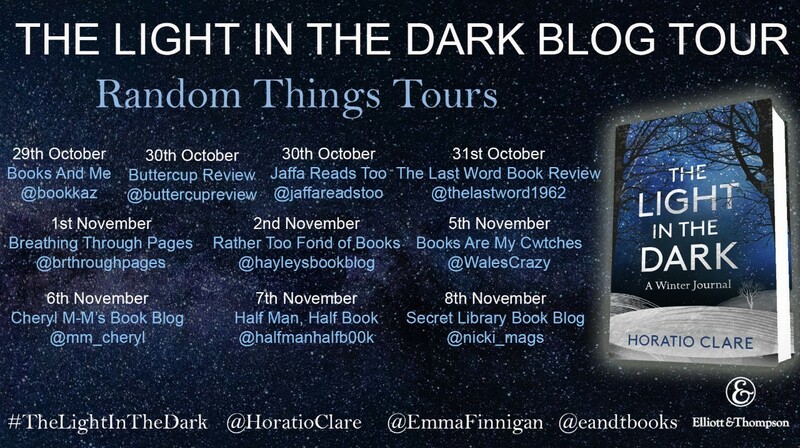 I am sure that this is just the start of many such dark investigations for DS Allendale and her team I can't wait to see where the series takes them next. Mel Sherratt is the author of eleven novels, all of which have become bestsellers. In 2018 she was named as one of her home town of Stoke on Trent's top influential people, she lives in Stoke on Trent with her husband and terrier, Dexter. 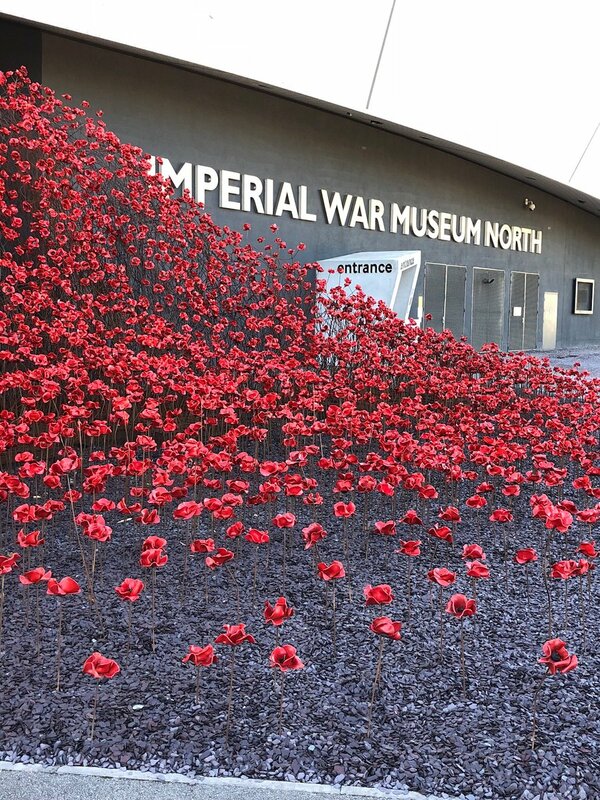 The Poppies Wave and Weeping Window designed by Paul Cummins and Tom Piper have been on tour around the UK since July 2015. The two sculptures were initially part of the Blood Swept Lands and Seas of Red at the Tower of London in the summer and autumn of 2014. 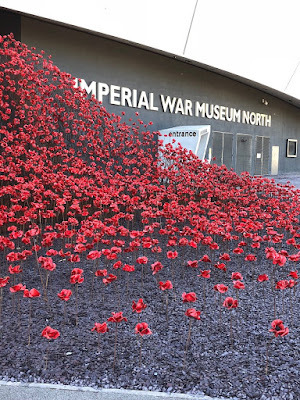 At the end of the tour in December 2018 both of the installations will be preserved for the nation and will become part of the IWM collection with Wave remaining at IWM North in Salford and Weeping Window at IWM London. 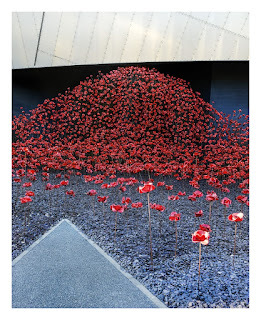 On a glorious autumn day this week I visited the Poppy : Wave installation at the Imperial War Museum North at Salford Quays. People stood quietly, some in contemplation, others walking around the installation to view from different angles, many taking photographs on mobile phones and digital cameras. 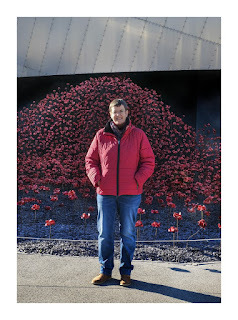 On every face I saw respect for the thousands of war dead who were represented by each of the scarlet poppies that cascaded in a graceful arch, each symbolising a life which was lost forever. Russia, 1534. Elite clans battle for control of the toddler who will become their first tsar, Ivan the Terrible. Amid the chaos and upheaval, a masked man mysteriously appears night after night to aid the desperate people. Or is he a man? Sixteen-year-old Nasan Kolychev is trapped in a loveless marriage. To escape her misery, she dons boys' clothes and slips away under cover of night to help those in need. She never intends to do more than assist a few souls and give her life purpose. But before long, Nasan finds herself caught up in events that will decide the future of Russia. And so, a girl who has become the greatest hero of her time must decide whether to save a baby destined to become the greatest villain of his time. My knowledge of this period in world history has been woefully neglected so I came into The Golden Lynch knowing absolutely nothing about the Tatars and the Russians and where they were at this point in their collective history. The story has a dramatic opening chapter which introduces us to sixteen year old Nasan Kolychev who witnesses a terrible tragedy which, despite her yearning for adventure, will chart the path of her life forever. Terrible consequences arise from this tragedy and Nasan, caught between two worlds has to try and make sense of what is happening around her, especially in light of her loveless marriage to one of her family's enemies. Making sense of the ever changing world around her is important to Nasan and she is something of a feisty heroine especially when her life, by her own choosing starts to become more adventurous. 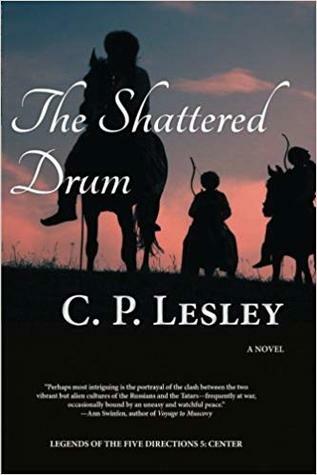 The story has a really authentic feel to it and, despite my lack of knowledge about the history of the time, I was very quickly drawn into the whole adventure and, to the author's credit there is a lot of information, but all is easily readable and not at all over complicated. 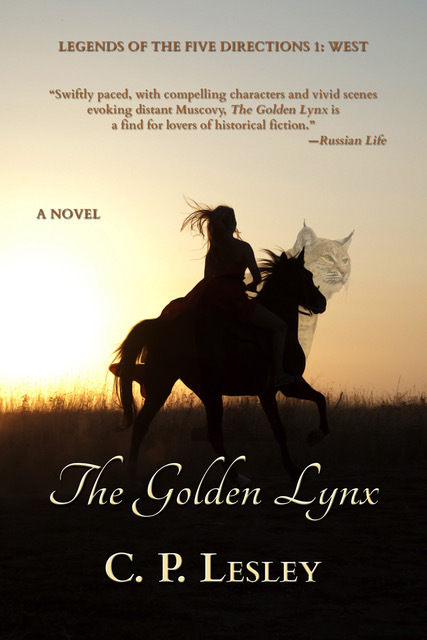 The Golden Lynx is the start of a whole series of historical adventures, which I am sure are all written with this author's enthusiasm and keen eye for historical accuracy. 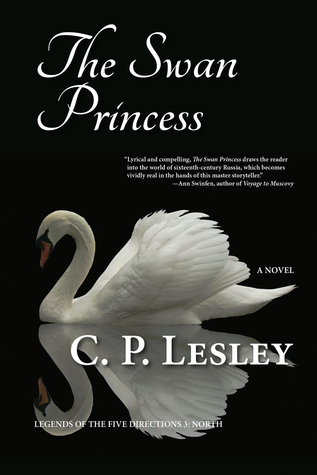 C. P. Lesley is the author of eight novels, including Legends of the Five Directions (The Golden Lynx, The Winged Horse, The Swan Princess, The Vermilion Bird, and The Shattered Drum), a historical fiction series set in 1530s Russia, during the difficult childhood of Ivan the Terrible. Find out more about her at http://www.cplesley.com. 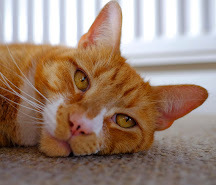 Hello C P, welcome to Jaffareadstoo. 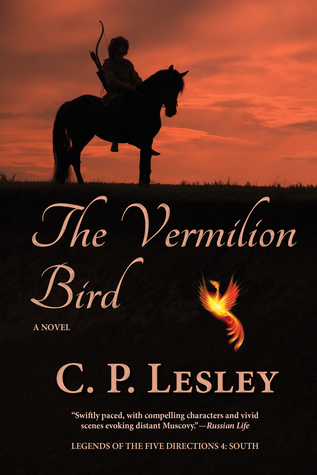 Thanks for spending time with us today and for sharing your love of writing historical fiction. As a historian who also writes historical fiction, what I love most is the freedom to make things up, to imagine the past, to play with possibilities. Although I feel bound by the sequence of events, to the extent we can determine what it was, even that carries in it a kind of freedom: sequences tell stories. Why did Napoleon advance in that direction, not this one? Why then, and not two days later or a week earlier? We never have all the answers, and in the gaps lie spaces for a novelist to fill in. Now if people were always rational, the process would be less interesting. But we all know the role that emotions play in decision making. Not just emotions, either: lies and coverups are as old as time. People routinely retell their stories after the fact, making themselves look better and their opponents worse. 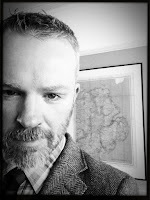 Even where documents exist, and in the period I write about they usually don’t, a novelist still gets to decide which of several conflicting explanations really drove a particular course of action and which alternative stories remain untold because those who lived them had no access to the written word. In medieval Russia, the setting of my novels, whole categories of people had no means to express themselves in writing: the poor (80–90 percent of society); women (the usual 50 percent plus); anyone who lost a battle with those in power. And that’s just historical figures. As a novelist, I also get to invent people, which I like even better. I tell stories about women finding their own places in a wider world that wants only to turn them into obedient housekeepers and baby factories. Their roads to self-discovery vary according to their personalities. Nasan, a natural warrior, learns to expand her interests without sacrificing her essential self. Firuza, more conventional by nature, responds to the challenges posed by her brother’s incompetence by tapping unsuspected strengths. Maria actively resists change, only to discover that her new family with its weird (in her mind) expectations of wives provides a fulfillment she didn’t know she was missing. Roxelana uses her allure to manipulate men into doing what she wants. Even the mothers, who’ve already made their peace with society’s demands, differ in their solutions. Natalia thrives in the role expected of her, managing a household of several hundred people and its associated estates like the small corporation it is. Sumbeka delegates her household tasks to others, ordering them hither and yon while she acts as her husband’s most trusted political and diplomatic adviser and the communications hub for their entire extended clan. Researching these stories offers its own special joy. Oh sure, there’s the chore of plowing through weighty tomes festooned with notes—seldom a happy thought at the end of a long day’s work. So many of the tomes, too, fail to reveal the important things: what ordinary people ate and wore, how they thought about the happy and not-so-happy events of their lives, how they furnished their houses or talked to their children, what a particular piece of money would buy—never mind the all-important smells and tastes and sounds. But oh, the magic of discovery! For me, the delight of research is stumbling over unknown or forgotten possibilities. The bandit chief who became a saint; the officially Muslim Tatars who continued to revere the clan spirits known as the grandmothers and tell tales of women warriors; the medical mysteries and herbal concoctions so useful for sending unsuspecting characters to their doom or into a trance; that odd, disastrous military campaign that took place at just the right moment to challenge a hero in unexpected ways. It all feels like dipping a toe into the flowing River of Time. As people say when asked why small children love dinosaurs, “they’re big and they’re dead.” The past, too, is both vast and gone. This place where most of us wouldn’t want to spend our lives is fascinating to experience through a book, a film, or a TV show. And that’s why I write historical fiction.